Enjoy the unique look and feel of this beautiful traditional style loveseat in your living room or den. Featuring plush cushions, turned feet and a glittering nail head trim, this loveseat is the perfect place to relax after a hard day at the office, or a great place to lounge in with a good book. Available in a variety of fabrics and leather options, this loveseat works well in any decor, allowing you to customize your own personal style! The Bexley Traditional Love Seat with Nailhead Trim by Flexsteel at Williams & Kay in the Anchorage, Mat-Su Valley, Eagle River, Alaska area. Product availability may vary. Contact us for the most current availability on this product. Wood & Finish Feet available in several different finish options. Enjoy the rich comfort of the Bexley collection in your home. Featuring a variety of pieces, the Bexley collection is the perfect addition to your living room or den. 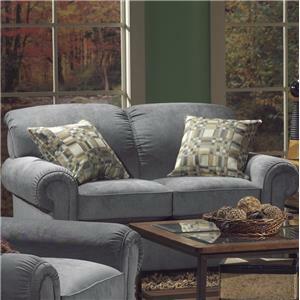 You and your family are sure to enjoy the soft comfort of supportive cushions and plush, rolled arms. 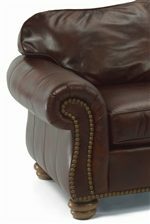 The Bexley collection features a strong Traditional aesthetic, featuring turned feet and nail head trim accents that bring an "old world" elegance to the collection. The Bexley collection is a great option if you are looking for Traditional furniture in the Anchorage, Mat-Su Valley, Eagle River, Alaska area. Nail Head Trim Adds a Subtle Sparkle to the Rolled Arm of this Sofa. 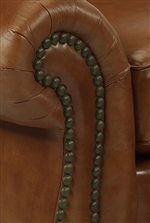 Supple Leather Adds a Luxurious Feel to this Sofa. Browse other items in the Bexley collection from Williams & Kay in the Anchorage, Mat-Su Valley, Eagle River, Alaska area.